Since that time, I’ve enjoyed more experience with roots and have become fascinated by their scent, structure, and function. In our oldest son’s classroom, a clear planting box shows the roots of seedlings as they grow. In the sunlight of my laundry room, I recall being stunned when, after only a few days of germination, I saw my zucchini plant’s six-inch root hiding curled in the tiny planting cup. Barely two inches pushed up past the soil’s surface towards light. When visiting Mr. and Mrs. Wendell Berry, friends and I enjoyed a discussion prompted by the large poster prominently displayed on their refrigerator. It showed the difference between the shallow root system of annually planted wheat seeds versus the thick, full root system that comes when perennial seeds are sown. This past spring, I took part in an order for 1,000 strawberry starts shared among neighbors and friends. These plants were 95% roots, with little or no green vegetation, looking mostly dead to me though I knew better. They were shipped in from New England and arrived with instructions to plant as soon as possible. They came two days earlier than we anticipated, so my spot for them wasn’t quite ready. I worked all afternoon and into the evening. As the sun inched towards the horizon, I tucked the last of my thirty plants into their new beds. Moments later, a gorgeous rain began to fall. I sat, in the rain, imagining the eight-inch-long roots spreading out in the ground, finding their own place to grow and soak in the rain. In this moment, I found my own thirst of spirit quenched. I was made aware of what keeps me rooted and grounded. Through these plants, I met, helped, and was helped by neighbors all seeking to grow some tiny delicious fruits. And with many of those who took part, conversations followed about how our desire to join in wasn’t just for the plants themselves, but to take part in something larger and learn our own rhythms of connectedness. We could have all placed our own orders, made trips to the farmer’s co-op alone, or just continued to buy berries at the markets around us. But instead, over forty households in East Nashville are now nurturing little patches of berries that were once together in the same Massachusetts field over a thousand miles away. The specifics of what transpires under the surface of the soil are largely unknown. When uprooted at the end of the growing season, my seven-foot-tall okra plants showed strong but at the most only twelve-inch roots. Perennials and other plants may truly look dead, yet the root lives and continues to prepare for the next season of fruitful beauty. It is the same with our souls. We cannot see all that is being worked out below the surface. The strength of what lies beneath is able to sustain, support, and give life to great things. When emotional storms come, deep-down strength is able to hold fast and prevent uprooting and permanent damage. When my relationships seem dry, weak, and lifeless, I hope for refreshment and the “scent of water” to foster new growth. Much like I am incapable of making clouds let loose rain to shower the plants in my care, I’m unable to force such refreshment elsewhere. And yet it comes. I have recently been working to share new music for children (from my friends so wonderfully named Rain for Roots), and that process (as well as the music itself) has been teaching my heart in unexpected, much-needed and refreshingly lovely ways. Creative work in community can be like life-giving water. If I had actual roots they would be nourished, oxygenated, and able to function best from the steady rains of meaningful endeavors. I’ve loved learning how each part of a creative team lends its own function and beauty to the work. And though I’ve worked in and around the music business for thirteen years, this project for little ones is the first that has come with a deep, personal connection and vision. As I ship CDs all over the world and move through the day-to-day needs of this project, I get to see firsthand how relational connectedness bears fruit. When news of a little heart engaged in the music comes to one member of this creative team, we share it with all the others, offering deep encouragement. The “communal ideal” is key in my growth. I used to think I could charge ahead in my own plot with the hopes of seeing fruitful results. I still often trust myself to gauge what my soul needs. I attempt the installation of rough “irrigation” to my heart. I pretend that I am drought-tolerant by nature. 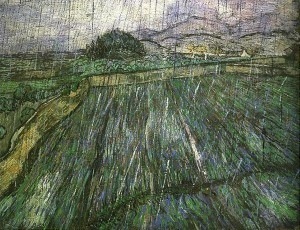 Vincent van Gogh, "Rain," 1889I set up a Google Alert so that I’m automatically notified when people on the web use the term “Rain for Roots.” Interestingly, as a result of this long season of physical drought in our country, many of those reports have not been about music, but rather the much-needed rain and how to guard against permanent root damage. As the reports appeared in my inbox, alongside album reviews and blog posts mentioning the songs, at least as many articles came through exploring the tension and fear related to widespread drought. As I read some of those, I became aware of another surprising phenomenon that causes rain-desperate plants to suffer when heavy rains come. This saturation after extreme dryness can cause roots to become suffocated as rainwater gathers and forms a block against the oxygen they need. Drought brings a slow death, yet periods of drought followed by heavy rains are equally detrimental. Again, with my soul, the same is true. I’ve found that I flower and fruit best when there is regular, beautiful rain in the form of lasting, creative, community-oriented endeavors. When there is no rain, crops fail, people are forced to leave their villages, trees weaken, animals and people suffer. Drought is a slow killer and even the most drought-tolerant vegetation cannot live forever without showers of rain or underground springs. Rather than try to manufacture floods of life-giving water, I ask for steady rains — for ourselves and for our garden plots, for the mystery of growth and fruit. For “neither he who plants nor he who waters is anything, but only God who gives the growth” (1 Corinthians 3:7). I haven’t heard of a growing season in which the perfect amount of rainfall came at the exact right moments to ensure the best, most healthy crop. No nearby farmer has reported a time where conditions for fungal growth are absent and temperatures are ideal for a bountiful harvest. It seems as though nearly every crop grown in the normal elements faces some sort of pest, harsh condition, or disease. Though I haven’t heard about such a season, I still long for that sort of experience and have hope that it will come one day. Meditating on all these things, it seems clearer now than ever that there are repeating patterns in creation. Images of a brain cell, capillaries, a lighting bolt, river tributaries, root systems, and even the known universe show the same patterns. These patterns show interconnectedness; dependency on older sections to supply the newer delicate areas with life. They show form and beauty and mystery. I marvel. I ask to know the “scent of water.” I ask to see more of the unseen world of relational connection and to see it for the intricate display of beauty it is. I want to be like roots sniffing out water in order to go on living fully — even thriving — and moving towards the best harvest yet. I recently read about Aristotle’s idea of a “Golden Mean” — the term for proportion (just the right size and placement), symmetry (roots evenly stretching with no obstacles), harmony (working with the plant to produce fruit), and moderation (steady rains) which came to be synonymous with beauty. A place to long for that is just right. For me, making beautiful things come to life, either in the garden, in my family, or elsewhere is my current experience of this golden mean. But I cannot do it alone. I have to rely on the other parts of humanity and ask for steady nourishment, in the form of gentle rains, for my ever-so-thirsty roots. Alice Smith is a wife and mother living in East Nashville, where she looks for truth and beauty in the friends and neighbors around her. Alice studied Journalism and Christian Ministries & Missions at Asbury University in Wilmore, Kentucky. After graduating in 2000, she married her high school sweetheart, Matthew, and moved to Nashville, where she worked in the music business for several years. Matthew and Alice are founding members of City Church of East Nashville and have two sons, Evan Edge (5) and Asher Hart (3). She is currently working with Matthew & his hymns, at the boys’ school (Montessori East), and managing a new project from Rain for Roots. Occasionally, Alice blogs at alicemarysmith.tumblr.com and sends tweets out into the ether at twitter.com/alicesmith. But she mostly just prays in fits and starts, between making meals and thinking about sweeping, that Jesus would come quickly to renew this world.